After cleaning up my actual desk at work, I decided I should clean up my desktop as well. And while sorting electronic files doesn’t quite have the same rewarding feeling as physical files – I still get enjoyment out of it (yup, I realize that is weird). One thing that I decided to clean up/clean out are the blogs that I read on a somewhat daily basis. Over the past year, I’ve accumulated quite a list of sites that I’ve bookmarked and try to visit a few times a week. Most of these blogs are incredible and inspirational; however, I’ve decided to fine tune my list. After my wedding I decided to stop reading wedding blogs. It was a hard adjustment but I think I can say I successfully cut that chapter out of my life. So with the exception of occasionally peaking at Snippet & Ink or seeing some ideas that my engaged coworkers send over, I don’t follow any wedding blogs. Up next: home improvement blogs. I’ve decided to limit the number of blogs that I read that focus on home improvement. I don’t need a daily reminder that Matt and I live in a one bedroom apartment – which we rent. Between the home improvement blogs and HGTV, I’m about ready to rip up the floor boards and start gutting my bathroom. Somehow I don’t think my landlord would approve. Thankfully I’ve decided that I can keep a few of these blogs on my list because one day, I hope to own a house and this is research for the future. Plus the family from Young House Love is just too cute to quite. 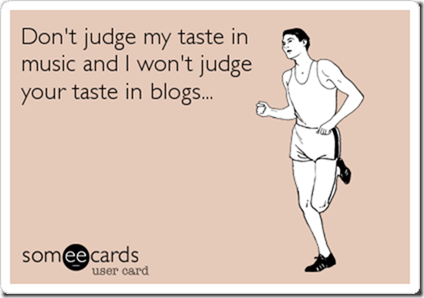 I’ve also decided to stop following blogs written by folks who are vegan, addicted to yoga or are master chefs. Let’s face it – that’s never going to be me. Comments and suggestions welcome! Here’s to another year of great blogs! Molly! Thanks for including me on your list! [I can’t believe my blog is on the same list as Smitten Kitchen… I mean, wow. What a way to liven up my lunch break.] Hope you are well and glad to have you back!